Dayi Daoxin (Chinese: 道信， Wade-Giles: Tao-hsin) (Japanese: Dōshin) (580 - 651) was the fourth Chán Buddhist Patriarch, following Jianzhi Sengcan (僧璨, died 606) (Wade-Giles: Chien-chih Seng-ts'an; Japanese: Kanchi Sosan) and preceding Hongren (弘忍, 601 - 674). Daoxin is said to have met Sengcan, the Third Patriarch of Chan, when he was fourteen years old, and to have attended him for nine years before going to study with Zhikai at Great Woods Temple (Ta-lin ssu) on Mount Lu. Daoxin was ordained as a monk in 607 and eventually settled at East Mountain Temple on Shuangfeng, one of the ("Twin Peaks") of Huangmei, where he taught Chan Buddhism for thirty years and attracted large numbers of practitioners. Daoxin’s teachings emphasized the practice of meditation. He and his successor, Daman Hongren are known as the originators of the East Mountain Teachings (“Northern School”). Daoxin was the first Chan master to settle at one spot for an extended period of time, developing a stable community life which would lead to monastic Chan communities throughout China. Chan practice was extended from meditation and asceticism to every aspect of daily life, a them which became central to Chan Buddhism. The earliest historical mention of Daoxin is in the Hsü kao-seng chuan (Further Biographies of Eminent Monks, 645) (Pin-yin, Xu gao-seng zhuan; Japanese, Zoku kosoden;) by Tao-hsuan (d. 667) A later source, the Ch’üan fa pao chi (Annals of the Transmission of the Dharma-treasure), written around 712, gives further details of Daoxin’s life. As with many of the very earliest Chan masters, the accuracy of the historical record is questionable and in some cases, contradictory in details. The following biography is the traditional story of Daoxin, culled from various sources, including the Wudeng Huiyuan (Compendium of Five Lamps), compiled in the early thirteenth century by the monk Dachuan Lingyin Puji (1179-1253). Daoxin, whose surname was Ssu-ma, was born in or close to Huai-ning, Anhwei, north of the Yellow River. He began studying Buddhism at the age of seven and although his teacher was a man of impure moral conduct, Daoxin maintained the Buddhist morality on his own without his teacher’s knowledge for five or six years. Upon hearing these words, Daoxin was enlightened. He attended Sengcan for the next nine years. When Sengcan went to Mount Lo-fu he refused permission for Daoxin to follow him, saying “The Dharma has been transmitted from Patriarch [Bodhi]dharma to me. I am going to the South and will leave you [here] to spread and protect [the Dharma].”(from the Ch’üan fa pao chi) For ten years he studied with Zhikai at Great Woods Temple (Ta-lin ssu) on Mount Lu. Zhikai (Wade-Giles: Shih-k’ai) was an adept of the Taintai and Sanlun schools and also chanted the Buddha’s name as part of his practice; Daoxin’s practice was influenced by these other schools. Daoxin received ordination as a monk in 607. In 617, Daoxin and some of his disciples traveled to Ji Province (modern Ji’an City in Jiangxi Province) and entered the town, which was under siege by bandits. Daoxin taught the residents the Mahaprajnaparamita Sutra (Perfection of Wisdom) which caused the bandits to abandon their siege. Daoxin eventually settled at East Mountain Temple on Shuangfeng, one of the ("Twin Peaks") of Huangmei, where he taught Chan Buddhism for thirty years and attracted large numbers of practitioners, some records say five hundred laypeople and monks. In 643, the emperor Tai Zong invited Daoxin to the capital city, but Daoxin refused to appear. Three times the emperor sent emissaries and three times Daoxin refused the invitation. The third time the emperor instructed his emissary to either bring back Daoxin or his head. When the emissary related this instruction to Daoxin, Daoxin exposed his neck and stretched it out to make it easier for the emissary to chop off his head. The envoy was so shocked he reported this event to the emperor, who then honored Daoxin as an exemplary Buddhist monk. In August, 651, Daoxin ordered his students to build his stupa as he was soon to die. According to the Hsü kao-seng chuan, when asked by his disciples to name a successor, Daoxin replied, “I have made many deputations during my life.” He then died. The emperor Dai Zong honored Daoxin with the posthumous name “Dayi” (Great Healer). Daoxin met Hongren on a road in Huangmei. Daoxin asked his name. Hongren replied, “I have essence but it is not a common name.” The Chan master asked, “What name is it?” Hongren said, “It is the essence of Buddhahood.” Daoxin replied, “Have you no name?” Hongren said, “None, because essence is empty.” With this, Daoxin passed on the teaching and the robe (making Hongren the next Patriarch of Chan). When a unique line of transmission of Bodhidharma Chan was developed during the seventh century, Daoxin was designated the Fourth Patriarch, following Bodhidharma (First Patriarch), the Buddhist monk credited with introducing Chan (Zen) Buddhism from India into China; Dazu Huike (Second Patriarch); and Sengcan (Third Patriarch). The teachings of Daoxin and his successor, Daman Hongren are known as the East Mountain Teachings, (“Northern School”) a precursor to the flowering of Chan on a national scale some seventy-five years later at the beginning of the eighth century. Daoxin was the first Chan master to settle at one spot for an extended period of time, developing a stable community life which would lead to monastic Chan communities throughout China. Heinrich Dumoulin, a widely-published authority on Zen Buddhism, speculates that as alms begging was no longer viable due to the size of Daoxin’s community and its relative isolation from centers of population, the monks had no choice but to work in the fields and develop administrative skills as well as engage in meditation practice. John R. McRae disputes this, asserting that the community received outside financial support and that it was “unlikely that the monks …maintained an agricultural operation of any significant size.” It is also likely that Daoxin was able to form a stable monastic community because China had just been reunified after 350 years of conflict, and the Sui and Tang dynasties allowed religious freedom. The practice of Chan was no longer confined to meditation and asceticism, but extended to the daily duties of life. The need to practice Chan in all aspects of life became a central theme in Chan teachings. The record of Daoxin’s teachings, The Five Gates of Daoxin, did not appear until the second decade of the eighth century, after Hongren’s record, and its historical accuracy is in some doubt. The Chronicle of the Lankavatara Masters, which appeared in the early eighth century, has Daoxin quoting from the Prajnaparamita (Perfection of Wisdom) and Pure Land sutras but it is unlikely that study of these sutras formed part of Daoxin’s teachings. Good men and good women, if you desire to enter Singular Samadhi Practise, you must be empty and at ease, and abandon all deluded notions. Not grasping at forms and images, you bind your heart to one Buddha, and concentrate on invoking his name. Wherever the Buddha may be, straighten your body and face toward him. If you can keep continuous awareness of this one Buddha, in this awareness you can see all the buddhas of past, present, and future. Why? The merit of awareness of one Buddha is infinite and immeasurable, and one with the merits accomplished by all the infinite numbers of buddhas. The Inconceivable Buddha Dharma is everywhere equal and without distinctions: All buddhas ride upon One Suchness, achieving supreme true enlightenment, endowed with all the immeasurable accomplished virtues and infinite eloquence. All those who enter Singular Samadhi Practise like this realize that there is no sign of differentiation in the Dharmakaya of all the countless buddhas. Whatever they do, their bodies, minds, and inner hearts are forever at the site of enlightenment. All their actions and conduct are bodhi (The Five Gates of Daoxin). 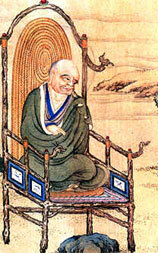 The "East Mountain Teachings" ("Northern School") of Daoxin and his successor Hongren, which emphasized self-discipline and regular meditation as the way to gradually achieve enlightenment, were later eclipsed by the "Southern School" of Hongren's disciple Daiji Huineng, which taught that enlightenment was achieved suddenly and instantaneously. ↑ John R. McRae, Seeing Through Zen: Encounter, Transformation, and Genealogy in Chinese Chan Buddhism (University of California Press, 2003), 31-33. ↑ Heinrich Dumoulin, Zen Buddhism: A History, Volume I, India and China (Simon & Schuster and Prentice Hall International, 1994), 98. ↑ John R. McRae, The Northern School and the Formation of Early Ch'an Buddhism (University of Hawaii Press, 1986), 33. ↑ Desheng Zong, Three Language-Related Methods in Early Chinese Chan Buddhism, Philosophy East and West 55.4 (Oct 2005). Retrieved January 19, 2009. ↑ 7.0 7.1 7.2 John R. McRae, The Northern School and the Formation of Early Ch'an Buddhism (University of Hawaii Press, 1986). ↑ Thomas Cleary, Transmission of Light: Zen in the Art of Enlightenment by Zen Master Keizan (North Point Press, 1990), 135. ↑ Heinrich Dumoulin, Zen Buddhism: A History, Volume I, India and China (Simon & Schuster and Prentice Hall International, 1994), 99. ↑ Dumoulin (1994, 1988), 99. ↑ Leaves from the Buddha’s Grove, Zen taechings of Daoxin. Retrieved January 19, 2009. ↑ Dumoulin (1994, 1988), 100. ↑ Andrew E. Ferguson, Zen's Chinese Heritage: The Masters and Their Teachings (Boston: Wisdom Publications, 2000), 28. Cleary, Thomas. Transmission of Light: Zen in the Art of Enlightenment by Zen Master Keizan. North Point Press, 1990. ISBN 0-86547-433-8. Dumoulin, Heinrich. Zen Buddhism: A History, Volume I, India and China. Simon & Schuster and Prentice Hall International. 1994. ISBN 002 8971094. Ferguson, Andrew E. Zen's Chinese Heritage: The Masters and Their Teachings. Boston: Wisdom Publications, 2000. ISBN 0861711637. McRae, John R. The Northern School and the Formation of Early Ch'an Buddhism. University of Hawaii Press, 1986. ISBN 0824810562. McRae, John R. Seeing Through Zen: Encounter, Transformation, and Genealogy in Chinese Chan Buddhism. University of California Press. 2003. ISBN 0520237986. Zong, Desheng. Three Language-Related Methods in Early Chinese Chan Buddhism. Philosophy East and West 55 (4): 584. Retrieved January 19, 2009. This page was last modified on 27 July 2013, at 14:37.